Chances are that if you were linked here from another blogger pal, you might be new to this place. 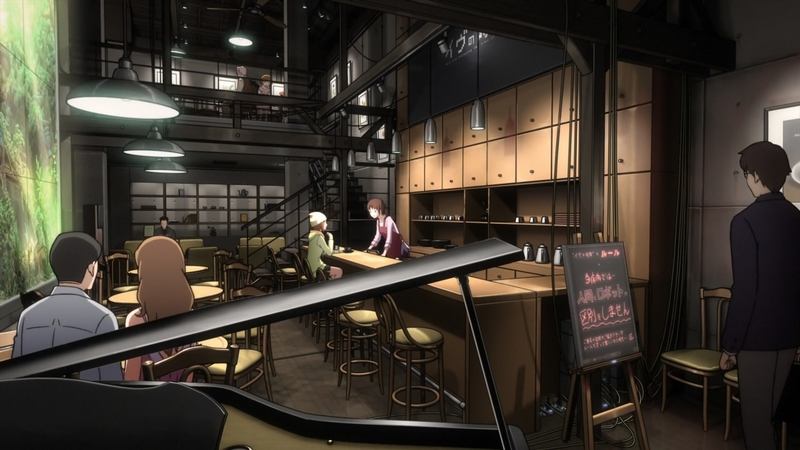 To those first-timers, “Hi, I’m Takuto, and welcome to my anime cafe!” As part of the OWLS blog tour’s third monthly topic for 2018, “Squad,” I decided to incorporate what would have been my standard review of Haikyuu!! season one into this look at friendship and how, exactly, teamwork makes the dream work. To uphold this OWLS favorite, I will be carrying the Haikyuu!! torch for this month’s tour! Though I’m not as passionate about this franchise as some of us are, I do hope I can contribute something of my own to the countless amazing posts out there. Thanks Lyn (and Lita) for the prompt! 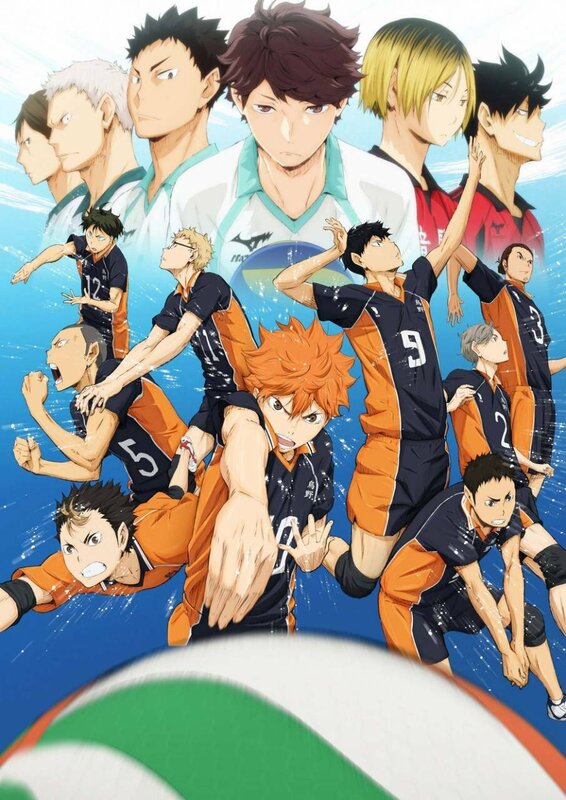 A brief spoiler-free discussion on the 25-episode spring 2014 anime “Haikyuu! !,” localized as “Haikyu! !,” produced by Production I.G, directed by Susumu Mitsunaka, and based on Haruichi Furudate’s popular shounen manga of the same name. 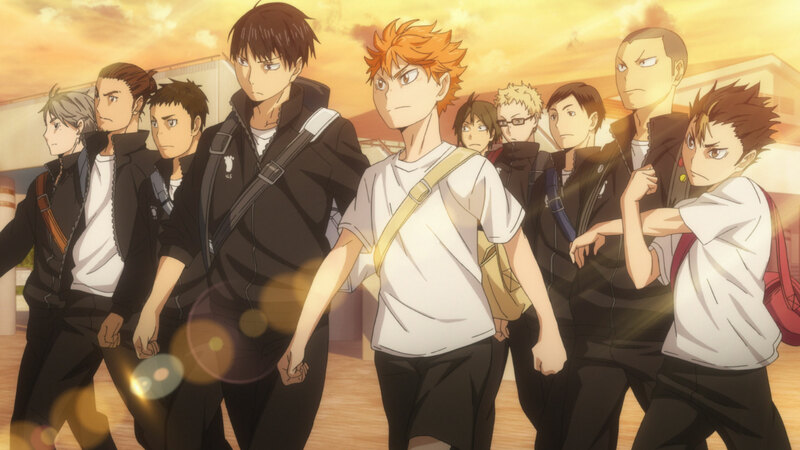 Shouyou Hinata began volleyball small and to this day remains one of the shortest players anyone has ever come across. Inspiration hit the loud lil’ guy when watching a volleyball ace nicknamed the “Little Giant” take the court by storm, and soon after, Hinata formed his own volleyball club in middle school. Brutal defeat in his team’s very first tournament by Tobio “King of the Court” Kageyama crushed motivations to continue the fight, though. In that moment, Hinata vowed to surpass Kageyama, but upon joining Karasuno High School’s volleyball team, Hinata found himself facing his “sworn rival” as a new fellow teammate. Despite his unusually high stamina and powerful jumps, Hinata’s short stature gives him a bit of a hard time when it comes to finding the right role to play. Surprisingly, Kageyama, the “genius setter” himself, also struggles with teamwork issues, and only by learning to work together will Karasuno stand a chance against the fierce competition. Excellently balancing the emotional weight of sports drama with lighthearted comedy, Haikyuu!! supports two determined athletes and their endeavor to settle a heated rivalry in order to reignite their team’s once-legendary status. Haikyuu! !‘s first season leads us through a handful of major games set up like little arcs just like any shounen series would. On the surface, it feels like one of those “This is how I became the strongest in the world” series, and in part, that’s not the wrong impression. Beyond Hinata’s constant screaming and boundless excitement lie more interesting subplots, however, such as finding the motivation to play, understanding that loss is prevalent in the path to success, and the ever-constant conflict between upper and lowerclassmen. The series, much like the volleyball players, never sits on one of these themes for too long. Once a character’s lesson has been taught, the momentum bounces across the court to quickly become another teammate’s chance ball! As previously mentioned, this underdog story appreciates a variety of themes crucial to the personal growth of not only oneself, but an entire team. 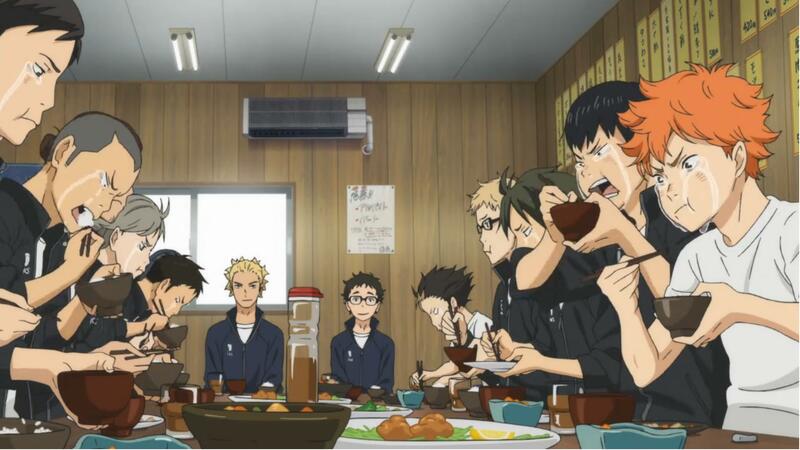 With every demoralizing insult and crushing defeat, the need for vengeance—to prove that Karasuno will fly again—snowballs into unstoppable enthusiasm for the 12 boys (and their rugged coach, squirrelly faculty advisor, and goddess of a manager). I mean, just imagine it: Back in the day, you were THE top dogs, the ones that everyone aspired to be! And now that you’re finally able to give back to that team that gave you so much to begin with, you find yourself continuing to face loss after devastating loss. As such, it is redemption that pulls the clumsy Karasuno along, but they will fail to earn the respect (and awe) of other teams unless they dig deep within themselves and learn exactly what makes each other tick. Achieving perfected, harmonious unity comes only through knowing your friends better than you know yourself. Unless some of its more reserved members start opening up to each other, I’m afraid Karasuno will only make it so far in the seasons to come. I’ll start with the elephant in the room since I basically had no problems with the rest of this top-tier cast. 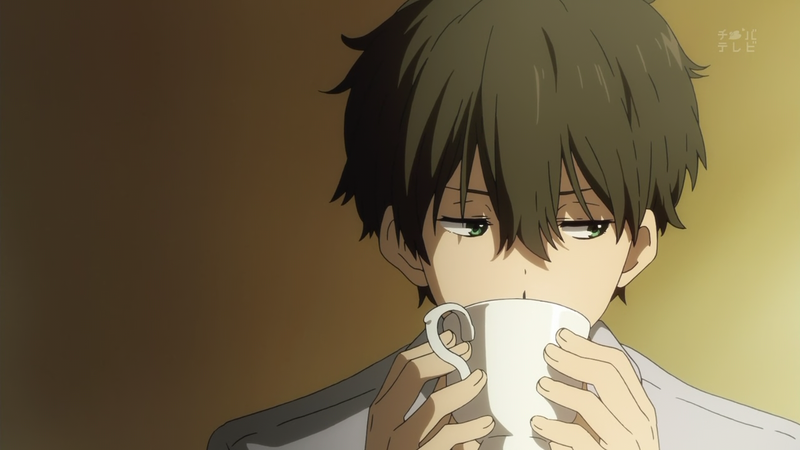 Hinata and Kageyama are arguably the most irritating, annoying characters in the entire show—which is incredibly unfortunate given their status as male leads. These are supposed to be the two that we root for, that we want to succeed, but on more occasions than not, I was sympathizing with the other side. In their defense, even the rival teams offer compelling stories all on their own—in fact, this well-rounded attention to all of the characters is the bread and butter of Haikyuu! 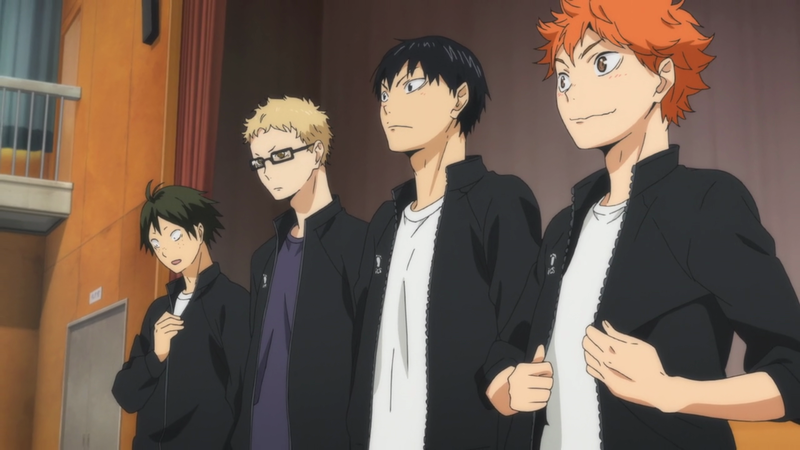 !—but it can be hard to cheer on the main two when Hinata is plain obnoxious and Kageyama is downright rude. By this first season’s end, I started to feel somewhat proud for how far they had come (recalling their earlier bickering and resistance to work together), and I do see myself warming up to them more in the next season. Daichi’s strong and steady demeanor makes him a model team captain; Sugawara’s calm, compassionate nature was LITERALLY ME back when I did sports in high school; Asahi’s aged appearance doesn’t stop him from being the biggest sweetheart (and Nervous Nellie) in the entire show. The third years will always be my favorite characters, no matter the series, but I can’t just stop here with Haikyuu!! . . .
Nishinoya’s overwhelming charisma not only makes him a player to be feared, but also one to be loved; Tanaka’s combo of goofy + grit never fails to lighten the mood; Ennoshita has this ability to silently relate to his friends given practically any situation; Kinoshita and Narita are always there to tame Noya and Tanaka. WHEW, looking forward to find out more about these funny second years. Of course, we can’t forget about the first years . . .
Kageyama, despite his oppressive exterior, strives to better himself by bringing out the best in his fellow teammates; Hinata’s inner strength to bounce back from defeat will always light a fire in my heart; Tsukishima AKA “best boy” candidate offers remarks that are so freakin’ snarky I just can’t, then proceeds to back up his smugness with the most wicked of feints during a match; lastly, Yamaguchi just wants to play the game everyone loves, and works long after dark hoping to one day be of use to his team. But #squadgoals doesn’t stop there! Looking at the other teams, Nekoma’s Kenma (voiced by Yuki Kaji, my guy) seems like your average silent character, but his catlike reflexes and calculating eyes make him the heart his high school team; and yes, even the handsome and charismatic Oikawa, a master of playing to his Aoba Josai teammates’ strengths, must be hilariously restrained by his friends from egotistically going all-out”Great King” on them! Similar to the OWLS “Team” theme from last year, we all long for connection, to be a part of something much bigger than ourselves. Not often are we granted the opportunity to bond with others so closely and celebrate the things we love. So, we have to take chances, risks even, if we wish to grow together. Haikyuu!! hits on four essential elements that build strong, long-lasting friendships (all coincidentally beginning with the letter “C”), and for every time a team member attempts one of these building blocks, beautiful, timeless moments are created. The weight of the game all rested on second-year Tanaka’s shoulders, yet again, and again, and again, Tanaka dropped the ball. There was a small moment like this during the tournament in which Hinata, a first-year, considered saying something nice or uplifting to baldy as he has always done for him. It’s not pity, it’s empathy. Hinata knows that feeling of repeated failure. When the underclassmen start supporting the upperclassmen (or at least thinking in that mindset), you can tell that the underclassman is starting to grow not only as a team player, but as a person, too. The older we grow, there’s a tendency for superiors to think that they exclusively must be the ones to guide the young. But in a team, that is not the case. Though there is a chain of command spearheaded by the captain, teammates are EQUALS. In school, work, or any other setting concerning a group that functions together with one goal in mind, people, higher or lower, need to support each other—to consider feelings of failure and success alike and support those who need it in the heat of the moment. Taking it the next step forward, teammates should give credit where credit is due. One’s age, ethnicity, gender, or status does not matter—nobody is above a nice compliment. This responsibility should not be limited to the captain or upperclassmen alone, either. Sugawara gives them out all the time based on how teammates are feeling that day, and that motivation pushes everyone, especially Hinata, to do their best. A true king asks for the help of his subjects—that is what sets Oikawa, “The Great King” (and even Sugawara) apart from Kageyama, the “Dictator.” Communication is key in both sports and life in general. Kageyama cannot and should not rely on Hinata’s god-like quick ability all the time; as setter, he needs to learn how to pass to teammates like Tsukishima more, and maintain an open communication line that doesn’t look so grumpy. Gradually he improves, and I’m looking forward to see just how much better he’ll get. Above all, nothing pushes teammates like a little friendly fire. Ultimately, friends want to surpass the challenges that other friends set for them, and this different form of support manifests in rivalries that continue to improve, shape, and make teammates stronger. Hinata swears to be the one to take Kageyama down, giving him some purpose to his play. Nishinoya wants Asahi to give his all and never feel sorry, even if fighting a losing battle. Sugawara understands his limited role thanks to Kageyama’s genius, but he always tries to observe from afar and apply reliable tricks to shake up Kageyama’s stiff repetition. Even Tsukishima and Oikawa verbally confront Kageyama to draw out the fire within themselves! Haikyuu!! delivers exhilarating volleyball action and inspirational sportsmanship through positive vibes, overcoming failure, and teamwork. I purposefully stuck to this first season alone to highlight the beginnings of a real squad, not the end result. Why? Because it makes each of these team-building exercises all the more powerful. Take that feast scene from the end of episode 24 for instance: it is sometimes the moments of shared silence between team members that impact viewers more than dialogue ever could. The absence of dialogue here ironically speaks volumes about Karasuno’s relationships, emotions, and mutual feelings toward their latest match. Definitely my favorite hard-hitting scene from the entire season. At the same time, sometimes fiercely shouting our feelings out loud can be enough to convey those shared emotions with others, as show in the way Noya motivates the guys, or Kageyama and Hinata’s release of anger by blindly yelling in episode 25. These simple, even silly, moments are what bond squad members, their goals, aspirations, and frustrations alike. Karasuno still has a long way to go, but every step these crazy guys take together allows their friendships to evolve with them. I’m gleefully awarding Haikyuu!! season one with the “Cake” rating, a show that’s too sweet for its own good! NOW, fans of this beloved series, HIT ME UP WITH YOUR THOUGHTS ON THIS FIRST SEASON OR THIS REVIEW IN THE COMMENTS (no spoilers, please)!! I’m very happy to have finally started this show, and though my “marathon” is running a bit slow, I am STOKED to watch more seasons!